Kim (seen here with her husband, Brian) is a Registered Nurse who helps bring new lives into this world. Yet, when she came in, her old car was sucking the life out of her because her air conditioner failed in our 100 degree weather. Make no mistake, her old Nissan Maxima served her well for 8 years and 160,000 miles. But, alas, it was time to move on. When Kim and Brian came on the lot, the temperature outside was in the high 90's. We worked together to find just the right level of vehicle.. with lots of great technology.. and a trim level acceptable to her. 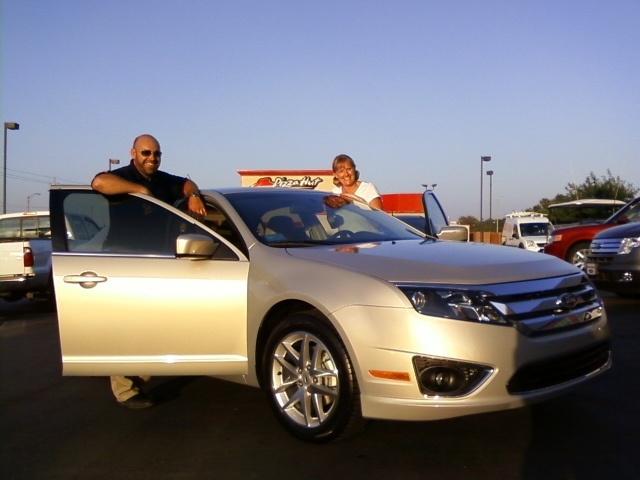 Well, she picked up her brand new, 2010 Ford Fusion SEL today. And, yes.. it was icy cold in her new car. Congratulations, Kim!!! Enjoy your car. It was a pleasure helping you find the right vehicle for you.